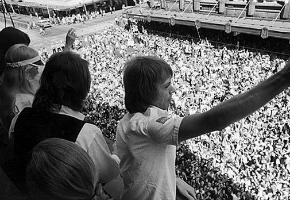 ABBA fans (this means you) prepare for another documentary on their rise to fame, ABBA: Bang a Boomerang centering around Australia’s pivotal role in their success. This premiere documentary, narrated by Alan Brough, includes key interviews with Molly Meldrum, who famously pushed for Mamma Mia as a single, Australian tour director Michael Chugg, ABBA The Movie director Lasse Hallström, bodyguard Richard Norton as well as their publicist, RCA’s Annie Wright. I’m guessing footage of actor Robert Hughes, who played a journalist in ABBA The Movie will probably be excised, but it sounds like a great watch. ABBA: Bang a Boomerang tells the inside story of Australia’s colossal 70s crush on the Swedish supergroup ABBA and their music, and how this unequalled and enduring fan‐worship changed them and us forever. Viewers were going into record shops wanting to buy the single. Molly rang RCA records asking about the release of Mamma Mia and was told there were no plans to do so. “We then played it again in defiance and they had no option but to release it… it was lucky, it went to number one” Meldrum continues. ABBA: Bang a Boomerang digs deep into heartfelt memories, cardboard cartons of memorabilia, face‐to‐face encounters, local pop icon recounts, lavish personal and public ABBA museums and Australia’s rich media archives to relive a moment of collective national ‘craziness’, when we did literally go ABBA mad. The result is a warm, bright, captivating engagement with ABBA‘s time Down Under that will remind us all of the band’s impact and how our open‐hearted embrace of all things ABBA would eventually define us. One in three Australian households owned an ABBA record – from Prime Minister Fraser to eight‐year‐olds around the nation, we were hooked even if some of us didn’t want to admit it back then and we didn’t realise the crush would be for keeps. By 1976 ABBA‐mania had truly gripped the nation, so much so that when the groundbreaking ABBA Australian TV special went to air it out‐rated the moon landing. ABBA became a magnet to some extraordinary characters who all contributed to the band’s rise to the top. This documentary has unprecedented access to this inner circle, including tour manager Michael Chugg, Hollywood film director Lasse Hallström, their bodyguard on the ’77 Australian tour Richard Norton as well as their publicist, RCA’s Annie Wright. Wednesday 30 January 8.30pm ABC1. This should be huge, ABBA now selling 400 million plus records making them one of the biggest selling pop bands of all time – and Australia was instrumental in their success. As someone who was a fan of Abba from the first time I saw them sing Mama Mia on Countdown, I’ll surley be watching this.